At first glance, it may seem like we are all about birds here at the Cape May Bird Observatory, I mean it is in our name and all. However, all you have to do is join our naturalists on one of our weekly walks and you’ll soon find out that most of us are all-encompassing nature nerds! Whether it’s identifying the various shrubs and wildflowers or calling out the names of dragonflies and butterflies as they whiz by, you’re almost guaranteed to walk away having learned something that extends past birds. This desire to share our broad passions with others allows for us to take advantage of the teaching opportunities that present themselves when we are out in the field. I’ve always said that one of my favorite aspects of environmental education is the unexpected, sometimes serendipitous, things that happen when you’re out on walks. It could be said that if you spend enough time outside, it’s inevitable that you will witness something really cool, but I think a lot of it just comes down to luck. Like seeing a falling star, you just have to have your eyes in the right place, at the right time. Luck seemed to be on our side last week during a CMBO walk at the Nature Conservancy’s South Cape May Meadows. A large Black Rat snake was basking along the west path and seemed indifferent to our presence. So, I did what any good naturalist would, I picked him up and gave an impromptu lesson on snakes. This large male was very cooperative and downright sweet as I gently handled him and allowed our guests to take photos and interact with him. Snakes get a bad rap and it more than likely stems from a combination of social prejudices and wrong information. In fact, snakes are one of the rare groups of animals that are facing threats from malicious killings along with the usual habitat loss and degradation, invasive species, and disease. The truth is that snakes are typically non-aggressive, fascinating creatures that play a vital environmental role in controlling prey populations and acting as a prey item themselves for top predators, including many birds of prey. As someone who has taught herpetology for many years, getting to share a moment in the field with this guy was a treat for me! handling a Black Rat snake. [Photo by Mike Crewe]. As we continued our walk through the Meadows, I was still abuzz with excitement from our new, scaly friend, when someone pointed out a Great Egret in one of the East pools. He was obviously trying to eat something rather large and I expected to see a fish or frog when I focused my scope on him. It was with audible surprise that I found him trying to eat a small mammal! From what we could see, and knowing the fauna of the Meadows, we believe he was eating a young Muskrat. Now, I have read of herons and egret eating mammals and I recall watching a video of a Great-blue Heron catching and eating a gopher that went viral on social media last year, but never had I witnessed this spectacle with my own eyes. We stood there, fascinated (and honestly, a little disturbed) as this egret dunked his prey into the water and manipulated its orientation a few times before swallowing the critter whole. South Cape May Meadows. [Photo by Margeaux Maerz]. The morning’s excitement left me wondering for the rest of the day, how much do we miss when we are out in the field? In a time of birding that is so focused on lists, have we lost the art of passive observation? Animal behavior is a fascinating subject to ponder but requires a great deal of patience (and in some cases luck) to experience first hand. So, I encourage you the next time you’re on a walk, whether it’s with us at CMBO or in your own back yard to slow down and take your time. Don’t be so quick to identify a bird and move on to the next, but rather sit and really observe the bird’s behavior. It’s during moments when you’re quiet and still that animals seem to put on a show. You may find it liberating to stop worrying about what's around the next bend in the trail but rather, take time to savior the moment and soak it all in. You just never know what you might see. As you explore around Cape May this time of year, it is impossible not to notice the energy that accompanies bringing forth the next generation of birds. From the Purple Martins at the State Park catching insect after insect to fill the many hungry mouths of their chicks, to the Mallards working to keep their brood of ducklings safely together at the South Cape May Meadows. New life is all around us! Parents tirelessly defend territories from potential predators and rival birds to ensure they have the resources to raise their young to fledglings. We hear their gorgeous singing and get to witness their skill and expertise as they build nests. We watch as they sit on eggs and cover young chicks to shield them from predators and the wrath of Mother Nature. In a matter of weeks, we will see parents teaching their little ones how to navigate their habitat and forage for food. We will hear the alarm calls when a predator is near and look around, searching for the danger ourselves. We are saddened by their losses and champion their success, and throughout it all, we watch in awe at their abilities to raise young in such a harsh world. 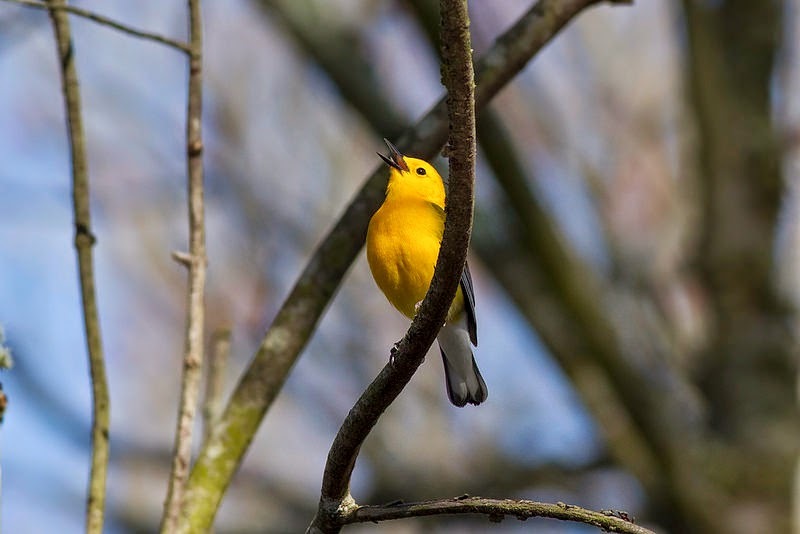 Prothonotary Warbler setting up a breeding territory at The Beanery. [Photo by Sam Galick]. 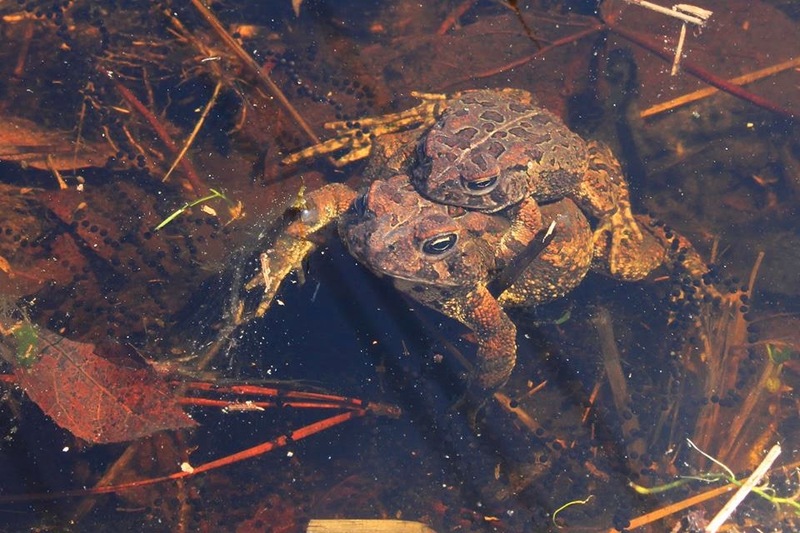 Fowler’s Toads in amplexus. [Photo by Bob Ferguson]. 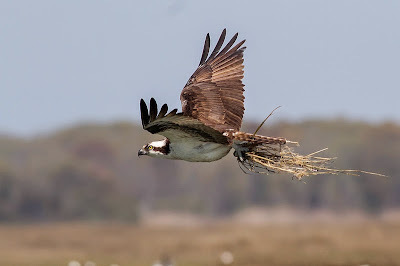 Osprey carrying nesting material in Jarvis Sound. [Photo by Sam Galick]. Cape May has Red Knots - it's official. Cape May Bird Observatory's Spring Weekend festival has been an awesome event once again and, though those pretty warblers were notably in short supply for us this year, everything else fell into place wonderfully. A quick straw poll of folks that were in town for a wonderful spring weekend drew one clear conclusion as to what the highlight was - the Red Knots. Delaware Bayshore beaches from Norbury's Landing to Reed's Beach, and up along the Cumberland County beaches, were favored by Red Knots yet again. Gone, of course, are the wonderful numbers of the past - as too are the stunning hordes of horeshoecrabs, but numbers are still high enough to impress - and it's all because people care. A series of headline events in the popular media of late could make one feel that our planet is doomed (and it would be if some had their way!) but, turn the madness of the TV news channels off, ignore the nonsense from certain websites, and go look for yourself. For out on the back bays of New Jersey, Red Knots are here, because people care. Yes, there are those who simply see dollar signs when they look at the natural world, but there are those that are fighting back and there is an army of people who are realizing that we can all do good if we go out and get involved. 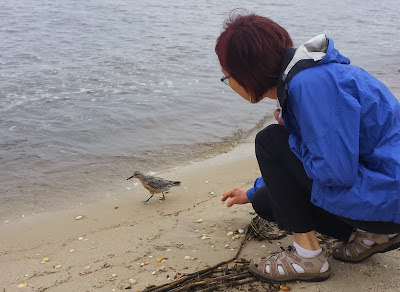 Here's a photo essay that surely demonstrates - Red Knots are here because people care. Because People Care - they came to our Spring Weekend Saturday evening event, where keynote speaker and author of 'The Narrow Edge: A Tiny Bird, an Ancient Crab and an Epic Journey', Deborah Cramer, told us of the dedicated people of Argentina who care for Red Knots on the wintering grounds, way, way down in Tierra del Fuego - a place described as the "Uttermost end of the world". Because of these people, there are still Red Knots in the Western Atlantic Flyway - and here are some of them, arriving in New Jersey just a few days ago. Because People Care - beach replenishment has been carried out along the bayshore after the ravages of hurricane Sandy. The beaches that were replenished can clearly be seen to be the ones now providing breeding opportunities for Atlantic Horseshoecrabs and these, in turn, provide feeding opportunities for Red Knot, Ruddy Turnstone, Sanderling and Semipalmated Sandpipers. This was the scene at Cook's Beach on Saturday. Because People Care - they came to see shorebirds being banded and learn the how, why, where and when of shorebird research. For without that knowledge, how can one make an informed decision? And surely this picture shows that you can never be too young to care about the planet! 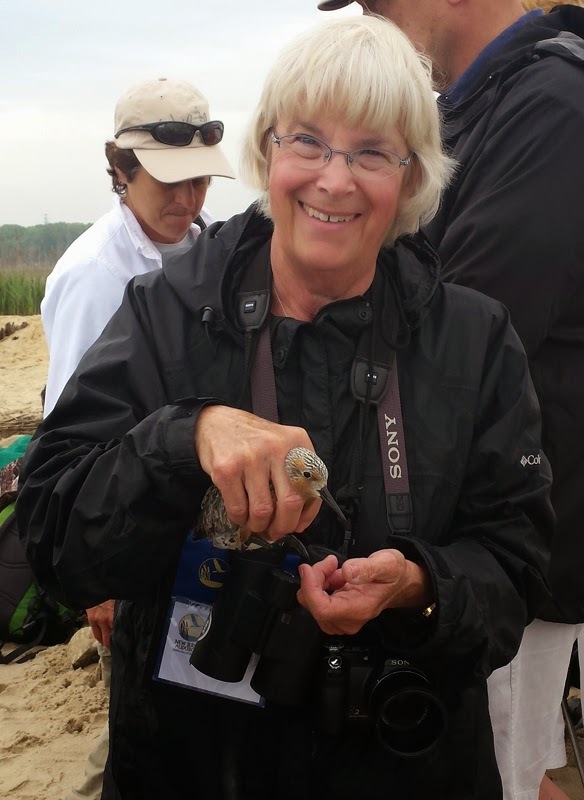 Because People Care - they join organizations such as Cape May Bird Observatory, New Jersey Audubon, The American Littoral Society, or The Wetlands Institute. And some, like Pat Perkins here, become life members and give so generously of their time. Here, Pat is about to release a Red Knot that has just provided researchers with valuable information. The Wetlands Institute's Executive Director, Lenore Tedesco, is co-ordinating volunteers in the background. 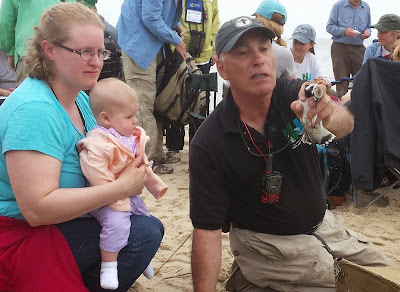 Because People Care - they queued up for the opportunity to release a Red Knot on its way. From here, this bird will head all the way to Arctic Canada, before turning back south to southern Argentina again in late summer. Because People Care - this Red Knot is able to continue to the Canadian Arctic, with a fat belly and a good energy supply in the tank for the journey. The application of small and lightweight leg flags allow individual birds to be identified and tracked in the field, without the need to recapture them. Birdwatchers can help with long term projects that study longevity and movements of these birds by noting the coding on the leg flag (together with the flag color) and reporting them on the shorebird banding website. Because we care about birds, we can all help in the process that allows us to understand birds better, such that we are better able to look after them. Because People Care - they work together for the common good. 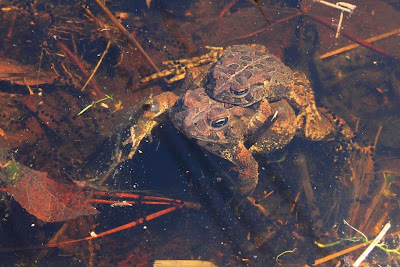 Research into New Jersey's wildlife involves a consortium of many organizations; organizations that are coming together to form a powerful alliance, but which are nothing without your support. New Jersey residents regularly vote to conserve their open space and keep the Garden State green, and being a member of a conservation organization is all part of that process. When you are taking photos against the light, you have to do a lot of tweaking in photoshop to get a reasonable picture - and you don't exactly get the best of views. And that about sums up the World Series of Birding - you don't exactly get the best of views, but getting the best of views is not the name of the game. Tomorrow, Saturday, May 9th, the Nation's bravest, craziest and most obsessive birders (as well as some thoroughly decent folks!) will be hot-footing it around New Jersey and checking off birds on their lists. A pointless exercise? Certainly not! For these great people are raising money for conservation, and for wildlife education and research. For every bird species they can check off, they will receive pledges from people who may not be taking part physically, but are very much a part of the day, for they have contributed the money that will serve wildlife for the coming year. It might be too late for you to be a team player in the World Series of Birding for 2015, but there's still time to make a donation and feel that you are doing your bit. I would encourage you to find the time to visit the World Series of Birding web page and help us all on our way. The natural world that is so important to us thanks you for your generosity.